There’s a reason or two (or five) why RXBAR ended up on our favourite paleo protein bar list. I don’t love to play favourites, but I’m willing to say RXBAR is my favourite. It reigns supreme when it comes to taste, ingredients, and variety, and you’ll learn why. If you’ve ever dabbled with protein bars, you’re probably familiar with a generally disappointing texture and taste. Most bars feel like they’re made of ingredients we generally aren’t cooking or baking with, and that’s true. RXBAR is a cut above the rest, because their ingredients – which you can find conveniently labelled on the front for full transparency – are real! We recognise them all! How cool is that? Plus, there aren’t any artificial sweeteners in the mix. If you’ve ever had maybe two protein bars in a day, you know protein powder + artificial sweetener = lots of cramping. Yikes. Okay, let’s keep raving on with our top five reasons why RXBAR is the best of the best, and why everyone’s talking about ’em these days. How often do you see the ingredients labelled directly on the front of the package? This was a brilliant marketing move on RXBAR’s part, and one they can feel confident in making. Not only is it all up front – including the “no B.S.” claim – but these ingredients are good for you. The protein in the bar, which comes out to 12 grams per serving, comes from egg whites rather than a whey, soy, or pea protein isolate. This means it’s MUCH better for digestion. The sweetness comes from dates rather than xylitol, sucralose, or erythitol which can also screw up digestion. Nuts add a boost of fats, and you’ve basically got a balanced meal in a package. These ingredients also make the RXBAR suitable for nearly any diet, from the plant-based eater to the paleo dieter. Everything is better when we have choice in the matter. 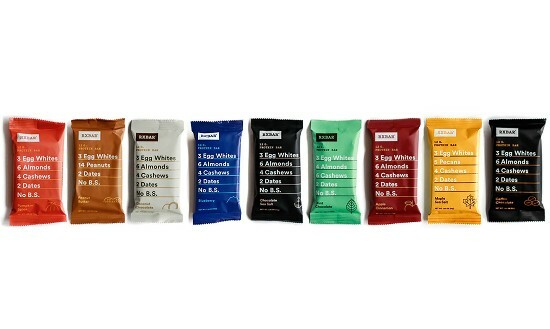 RXBAR has made some serious progress in its flavour variety, and every single one of them are delicious. This is great for picky eaters, and even the kids won’t have a hard time deciding which flavour they like the best! You can choose from 12 different flavours including blueberry, mixed berry, maple sea salt, chocolate peanut butter, coconut chocolate, chocolate sea salt, mint chocolate, apple cinnamon, coffee chocolate, peanut butter, pumpkin spice, and chocolate chip. It can be really hard to find a good bar that you can rely and trust upon, but the RXBAR will change all of that. We’re a culture of convenience, and for someone who chooses to live a healthy lifestyle and eat real food, this often means creating your own convenience. The RXBAR is a travel essential for me, and you can always find one or two in my carry-on. It’s a hiking staple, and I always take them whether I’m hiking a few miles or backpacking for a few days. The protein source means you can stay satiated while most convenient foods have too much sugar to say the same. It’s real fuel when you need it the most, and you can easily order these in bulk to stay prepared. Seriously. Most protein bars are chalky, artificial-tasting, and not-super-satisfying. The RXBAR changes all of that. The egg whites keep it firm and give it a nice, baked good texture. The dates come in to lend their natural sweetness while keeping it nice and chewy. These things can almost be tough to eat! The nuts strewn throughout add additional texture and crunch. It’s rare to be able to taste and appreciate all of the ingredients in a bar. No “fake” chocolate coating or grains to fill things out in this bar. The problem with most protein sources found in bars is that our bodies just don’t know what to do with it. Sure – some bars outweigh the 12 grams of protein found in the RXBAR, but is your body really taking it all in? Whey can cause stomach upset for many, plus it’s usually derived from a non-sustainable source. While grass-fed whey is absorbed by the body quite well, it can cause distress for those who don’t do dairy. Plant-based protein sources – especially soy – can be problematic for many reasons, one being your body’s inability to use it all. With egg whites, we increase bioavailability while also being inclusive of many people’s food sensitivities or intolerances. Since everyone IS talking about RXBAR, it’s popping up in a lot of shops and grocery stores. In the U.S., you can reliably find a variety of RXBAR at Trader Joe’s and Whole Foods Market. I’ve also been seeing them more at gas stations and rest stops, and I almost always see them in airports (score!). If you don’t have such luck, or you live outside of the U.S., you can always order them online. Purchase the 8-flavour, 16-count variety pack on Amazon. Want to try ALL 12 flavours? Try this variety pack. If you live in Australia, purchase RXBAR here. Have you tried RXBAR? What’s your favourite flavour? Don’t forget to share if you love this bar as much as we do! Please note that this post is not sponsored by RXBAR, however the Amazon link is an affiliate link and we earn a small % commission at no cost to you. There are additional ingredients, such as “natural” flavor on the back of the label…so the “no B.S” isn’t entirely accurate. They are very tasty though and definitely easier on my tummy than whey bars. I like the Maple one the best. Maple is my favourite as well! Their website clears the natural flavouring up quite well, and they are transparent about it if you ask. Here’s from their site: “Natural flavors are purified extracts from natural sources, such as a spice, fruit, or vegetables. In order to be used in food, natural flavors must meet strict FDA guidelines and safety criteria. The natural flavors used in RXBARs come from the real food ingredients such as fruit and chocolate and do not include propylene glycol, synthetic, artificial or GMO derived ingredients.” So, they’re pretty safe.